This title was reviewed on a standard Ps4. Reboots these days surface faster than a stray cat tossed in a pool and are usually about as fun as holding that infuriated, soaking wet feline next to your face. It’s no wonder eyebrows raised and middle fingers went up when the God of War reboot was announced in 2016. It’s no longer a question of if someone is going to put one of your favorite franchises into the oven for a reboot, it’s a matter of when—and if the new owners can cook, or if they’ll burn down the house of your franchise and piss on the flames. 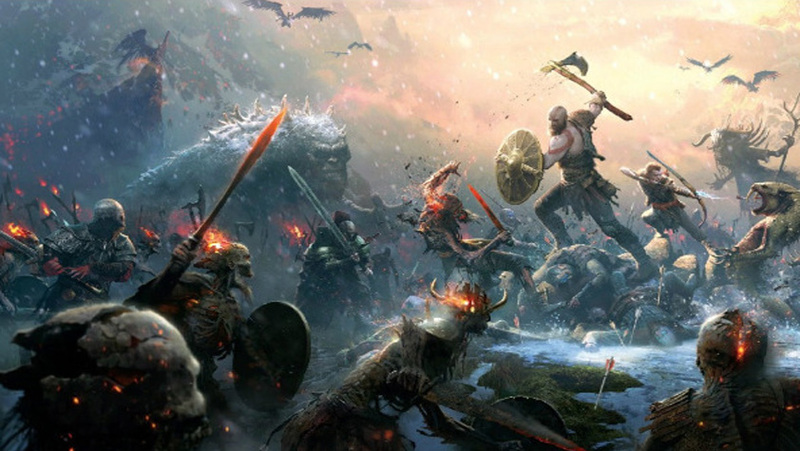 A lot of skepticism surrounds Sony Santa Monica’s 2018 “spiritual reboot” for the legendary God of War franchise—and rightfully so, since nobody was really asking for it or the many changes it has made to the God of War formula. Lay your doubts to rest, skeptics; hold out your hand and call your controller to you like Thor calls his hammer. You’ll be happy you did. I always felt the original God of War‘s story and portrayal of ancient Greece was brilliant and underrated. But I could understand why, seeing as story was never the true focus of the games. God of War (2018) will not fall victim to having its action overpower its story like previous entries, it will not rest on the simple notes of vengeance and hatred that drove Kratos before. Instead, the action adds weight to the story and both dance continuously and madly together under a Nordic moon. This tale, woven deep into Norse mythology, is a masterfully crafted tale of a former god-slaying world destroyer trying to raise a decent son in a foreign land where Kratos can’t read or speak any of the its many languages. Kratos does begin to live the life of a simple man, eventually having a son with a mortal woman from Midgard who we never actually meet. 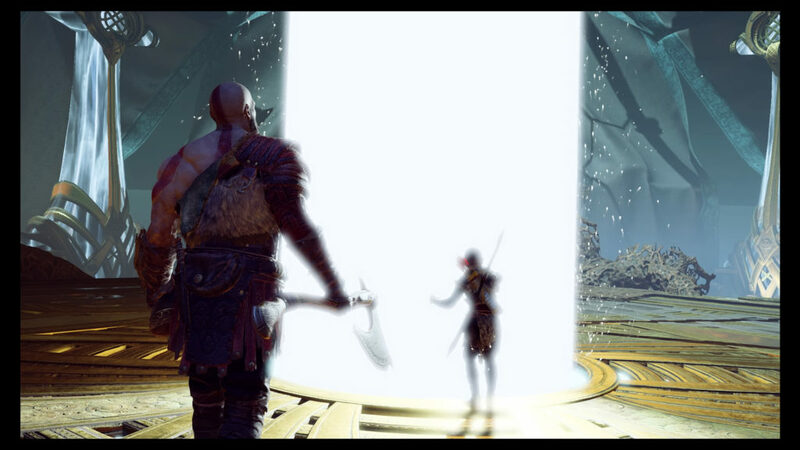 In fact, the game starts off with Kratos and his young son Atreus preparing the mother’s funeral with a very moving and silent ceremony. From Kratos’s cabin in the woods we are given our mission to fulfill Atreus’s mother’s final wish to have her ashes spread at the highest summit in all the realms. On paper God of War‘s plot certainly does not make a case for being a masterpiece, especially when you realize that the entire game is a single uncut camera shot, a task that is much harder to accomplish than most realize. 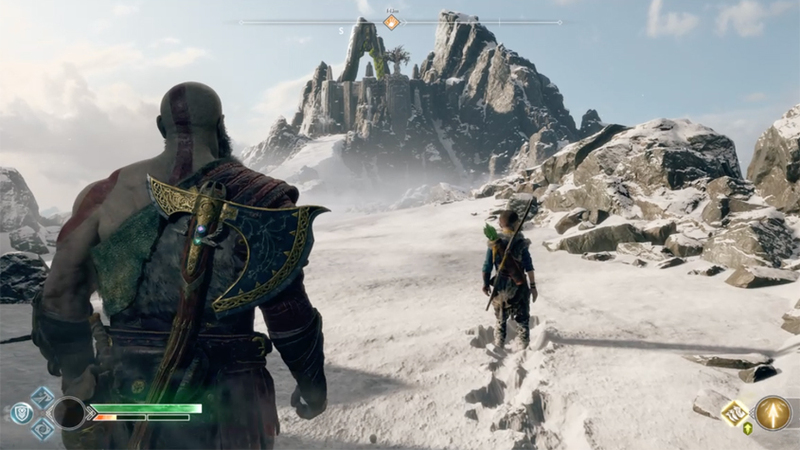 This means the camera never cuts away from Kratos and/or his son Atreus to show what’s happening anywhere else during the game, requiring that both characters and what they are doing to be fascinating enough that the player never gets bored of seeing them. It’s a risky move that is masterfully executed and one of the games many impressive and unique feats. The story of God of War will invoke powerful emotions in its players as it’s a story built on the ability of players to relate to the characters. 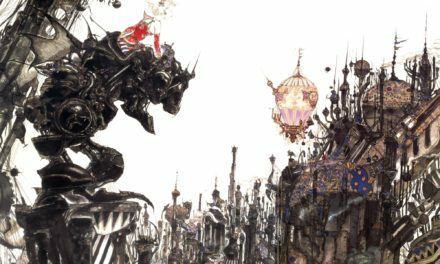 Even though our characters are dealing with creatures and entities of god-like strength in a world containing multiple dimensions that is the very definition of fantasy, it is remarkable how the game’s story always stays down to earth once the dust settles. It barely ever slows down, is packed full of detailed lore and characters, but never overwhelms the player. It can bewilder the mind, send chills through your skin, make you laugh, and pull on your heartstrings, all while bursting at the seams with the intense, fast-paced action that you expect in a God of War game. 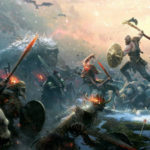 The 30-35 hour journey through the land of Midgard will encompass some of God of War’s most unique and compelling characters and locations to date, alongside equally jaw-dropping Nordic architecture and creatures, set in world that feels alive and has 1000s of years of history for Kratos to uncover. However for it’s large scale and expertly crafted world filled with mystery, at the end of the day it is Kratos himself that manages to be the glue that holds everything together. 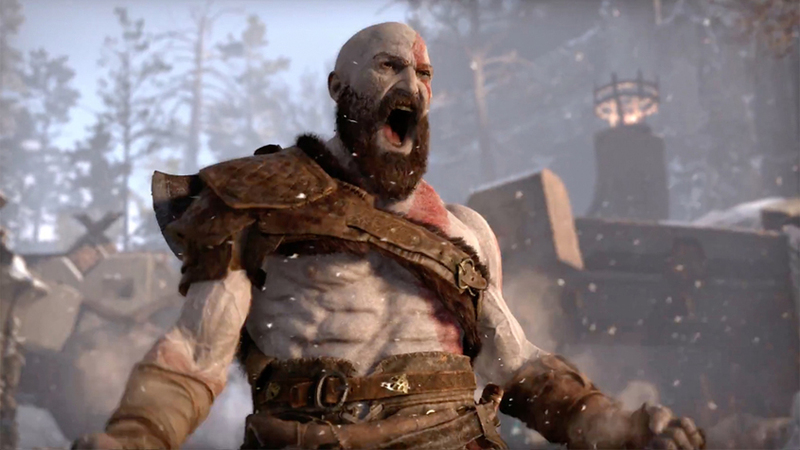 Make no mistake this is still the Ghost of Sparta and Sony Santa Monica have done an incredible job of capturing what a regret-filled Godslayer might become given a chance to start over. The preservation of Kratos character makes this game feel like the long awaited continuation of the original trilogy. 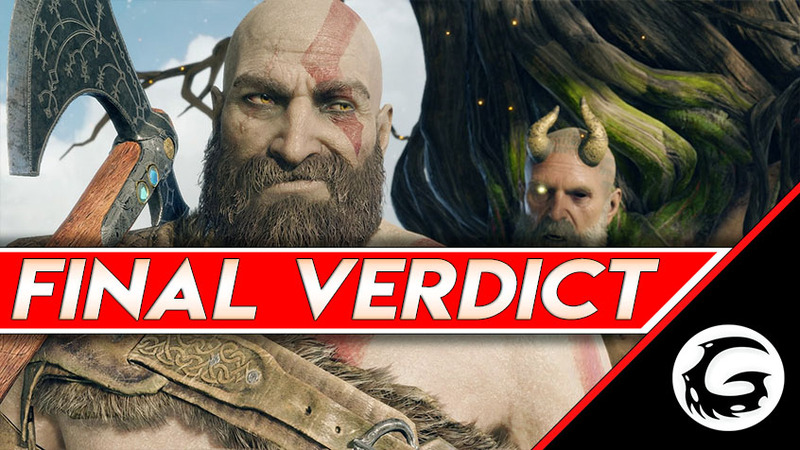 Even though Kratos’s original voice actor – TC Carson has been kicked to the curb, it is for good reason. TC Carson will always be the voice of Vengeance Incarnate, but this time around Christopher Judge turns Kratos into what you might expect for an ancient Godslayer. 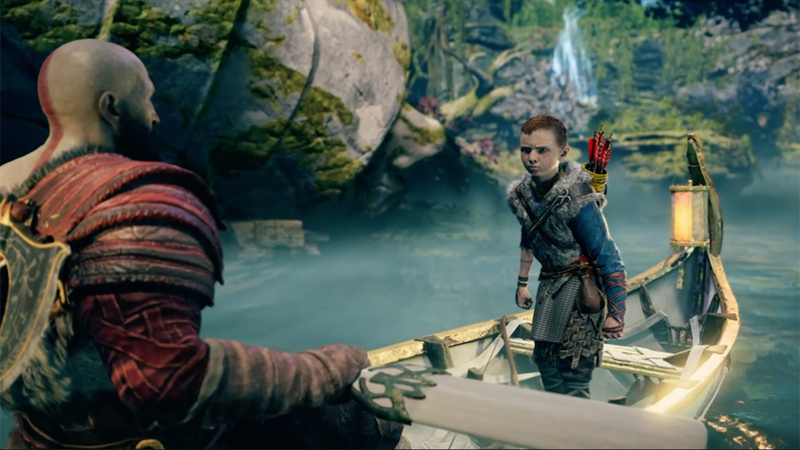 Atreus the boy finds himself in uncharted waters for a character, being both the son of a foreign god and somewhat a stranger to Kratos and players alike, while also being integral to gameplay. His character features another strong voice acting performance from Sunny Soljic, who does a great job of acting through all the wild emotions and moods a child might go through, and the kind that will test a parents love and patience. Their journey will also test their relationship and along the way, they will meet even more compelling characters, all with high-quality voice acting for a supporting cast, including some of the most massive characters in size to date for GoW which is saying alot. I can’t say anymore because you truly owe it yourself to meet these characters first hand because you will be hearing about them a lot and for good reason, they are all memorable. The main flaw I see with many of the supporting characters is that they exist out of convenience for Kratos. He just so happens to meet powerful healers, legendary blacksmiths, and an ancient loremaster that will literally take you head-first into the history of Midgard and it’s 9 realms. 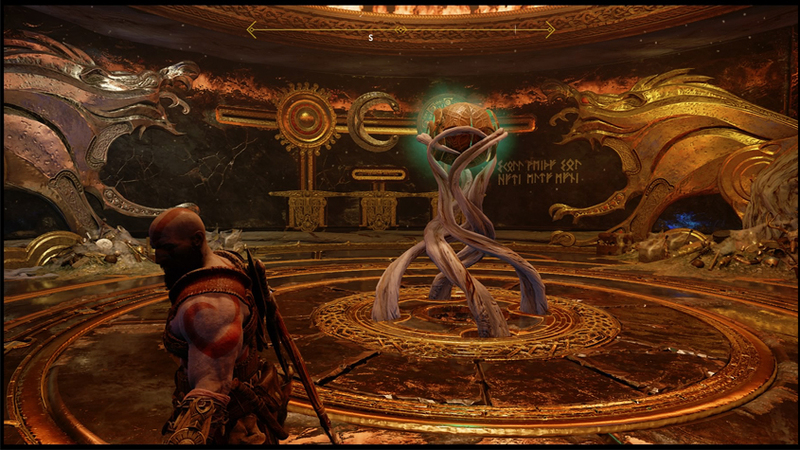 Some of the villains and bosses have weak or no motivations for hunting down Kratos, at least no motivations that are properly fleshed out. Perhaps one of the few negative results of the decision to have the game use one uncut camera shot. There is one exception for me, a character introduced early on who desperately wants to feel anything, even if it just his bones being crushed. The lack of motivations for some villains and the feeling of convenience for the supporting cast does not take away too much though somehow, and alongside the incredible voice-acting and incredible settings it’s going to be unnoticeable for some players. Lots of heavyweight titles like God of War get big budgets, which somebody might say is the reason God of War is one of the best looking games of all time, but I would remind them that is easy to waste lots of money as well, ask Bungie and the Destiny community. You can see where every penny of GoW went the moment the game starts, in every cutscene and in every battle. There is an attention to detail here that can only be created by a team that is truly passionate about every pixel, texture and has the talent and patience to make it reality. 5 years of patience. What’s more impressive is that the Ps4 was using dated hardware on release, and it’s practically ancient compared to modern gaming PCs of 2018. Sony Santa Monica should be praised for how far they were able to push the visuals in GoW, and in my 40+ hours with the game, the stock 30 frames per second may have dipped for a moment only a few times. The animations truly bring he game to life, in every enemy and boss, but especially Kratos and Atreus. Every swing of the axe looks as good as it feels, muscles flex, eyes get angry and you can hear Kratos’s war cries before they come out just by facial animations, especially for ones that have Kratos slightly turn towards the camera. The lighting and color palette all come together perfectly, whether your trekking through ancient ruins containing beautiful gold inscriptions and artwork hidden everywhere, or through fire and brimstone, everything in God of War simply looks perfect all the time. Especially the reality distorting effects, particles, and elemental effects, they are stunning. With perhaps an exception to fire, it can look fuzzy and dim sometimes. Perhaps the area of the game that has received more changes then everything else combined is the gameplay, which was also GoW’s most recognizable attribute. The pulled back camera that gave way to the bloodshed unleashed by Kratos wide-reaching and arcing Blades of Chaos are long gone, along with most QTE events. The gore has also been taking down a few notches but these issues are almost wiped under the floorboards by the games glorious animations as well as keeping the intensity of GoW intact. The camera sits much closer to Kratos now and gives you full control of the camera during gameplay and to help fully take in the games stunning presentation, unlike previous entries that had a fixed camera. Gamers familiar with Dark Souls, The Witcher 3 and Horizon: Zero Dawn will be right at home with this camera and the weight in Kratos’s movements. Camera controls feel smooth, and even solves problems that From Software has with big enemies in small rooms, in my time with the game the camera never clipped through anything, never got stuck anywhere, and never screwed me over during a fight, it is simply perfect. The biggest hurdle to overcome in GoW is the steep learning curve for its gameplay, especially early on when Kratos and Atreus have no skills, no chemistry, no abilities. Kratos and the Axe/Bare-Hand moveset will seem slow and sluggish, I felt it was underwhelming the first hour or so until I was proven very wrong. Gamers will have learned how to rock out with the Leviathan Axe, which is Kratos’s new instrument of death, and it plays melodies of sweet, bloody satisfaction that never get old once you learn the basic combos and hitboxes. As well as going full on Mike Tyson by dropping the axe and bringing out the fisticuffs for some hands-on Spartan plastic surgery. Also featuring a glorious ” This-Is-Sparta!” kick that will is far more useful then it seems for the resourceful. There is a weight and flow in the Leviathan Axe that Blades never had, and the game’s combat has taken a hard turn towards precision and accuracy as opposed to the wild and chaotic far-reaching hitboxes of the old games, while trying to maintain the speed and ferocity you expect with God of War. The Axe has a number of unlockable Throwing Skills as well, including headshot bonuses, tailing enemies, explosions on impact, pinning and freezing them, and weakness sensitive spots like tripping enemies up with well-aimed throw below the knees. 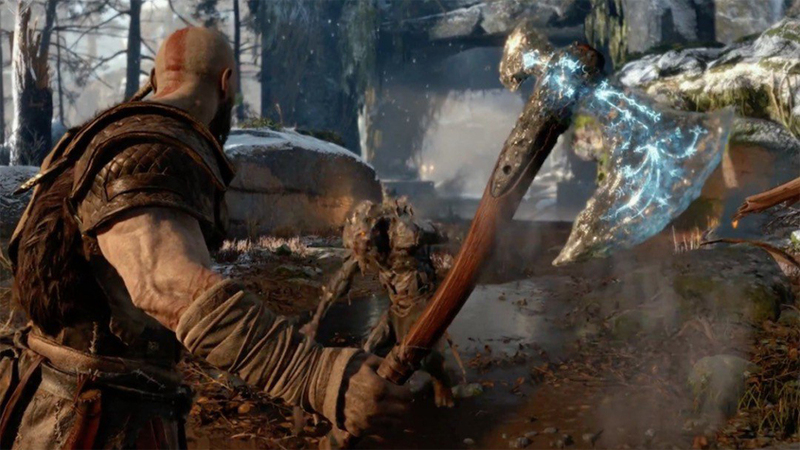 Kratos will have to recall the axe manually until the player unlocks other options in the skill tree, which can add another layer to a players combat style all their own. Even after 40 hours of throwing and recalling the axe, it never gets old and or less satisfying in fact I think it gets better. 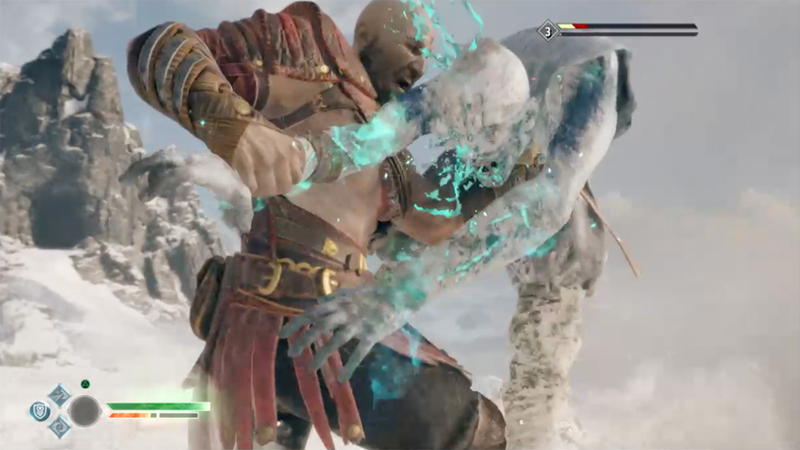 The sound of enchanted heavy metal slicing through the air the sight of it spinning back towards Kratos and the vibration/sound that is timed perfectly when Kratos grabs the handle is one of the games most simple yet addictive features. Fists are useful if your Axe is currently holding an enemy in place or being used to hold a spiked filed roof from collapsing on you, as well as building up the enemies stun meter. Kratos’s always satisfying power trip, god mode Spartan Rage also returns, building up mostly for the damage Kratos hands out rather than the damage he takes. Spartan Rage unlocks a whole new move set and has its own skills to unlock as well, but I would say it is the most underwhelming gameplay feature. 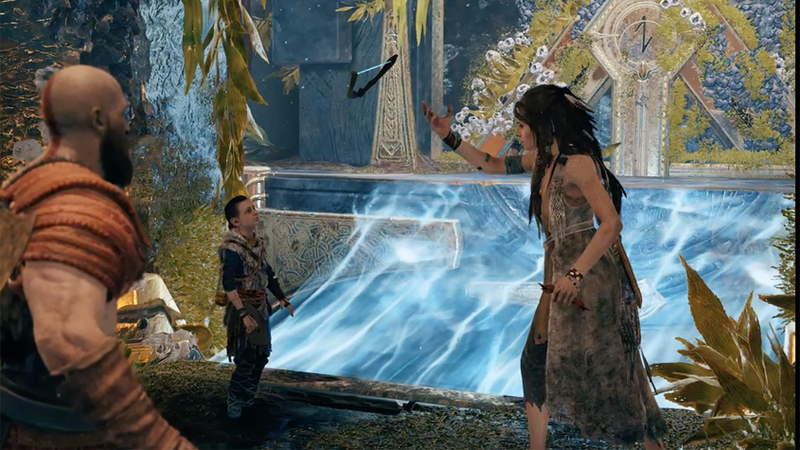 Atreus is also waiting for your command, he really struggles early on to be useful or to keep up with his father, but after he gains some experience at Kratos’s side he becomes one of the most unique CPU partners ever. He will provide some ranged support with his bow which can used to maintain combos, distract enemies or interrupt their attacks on his own, or where you tell him, and also contribute in numerous ways to the games numerous puzzles. 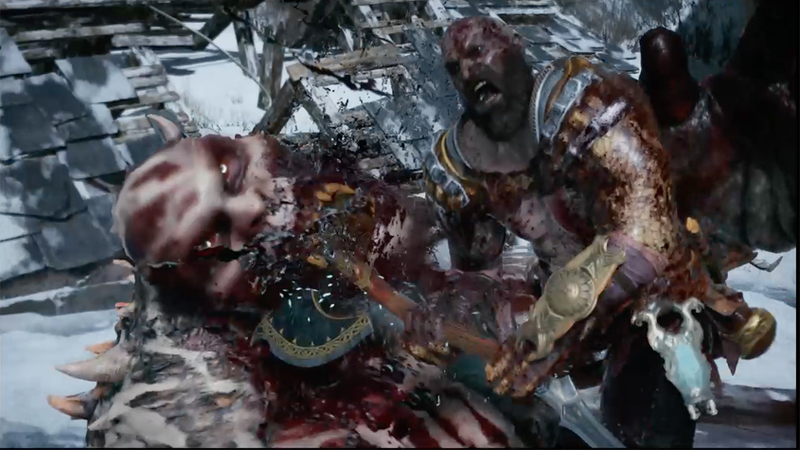 Later on Atreus will get right in the enemies face alongside Kratos, tripping them, choking them with bow leaving them wide open which becomes so valuable, dropkicking and even riding bigger enemies, on top of providing his own useful magic abilities. Essentially you are building Kratos and your own perfect Mini-Me to complement your playstyle, which God of War offers more ways to play then after thanks to introducing new RPG elements and an extensive skill tree, and far more elemental magic abilities in previous games. When it comes to the mid and late-game, I cannot talk about so much of it because of spoilers, but the mid to late game combat brings the Souls formula of combat to new heights of speed, action and cinematography. The speed you expect in a God of War game is still in tact, and there is nothing like the sensation of GoWs combat when all cylinders are firing. God of War takes quality over quantity when it comes to its enemy variety and design. There are a lot of reskinned enemies, especially for lower-tier enemies however these lower-tier reskins will gain more and more variants as the game goes on. Everything from arcing mortar projectiles, super-speed, shields, dual-wielding and enemies that can buff others and explode on death. There are aerial enemies with different elemental and status inducing affects, highly evasive enemies that use hit-n-run strategies and large-scale enemies. Last but not least, God of War’s magic and element attacks that come in the form of Light Runic attacks and Heavy Runic attacks, all using a weapon as a catalyst. You can have one of each equipped and there are dozens hidden throughout the campaign, side questing and exploration, more then any GoW before. You’ll find everything from super-armor melee attacks, massive shockwaves, projectiles, beams and more. All Runic attacks are measured in Status ( frost, electric etc) Damage and Stun, and can wildly change your entire approach to the game. They are satisfying to perform and watch, and fully upgradeable with most maxed out Runic attacks being over-the-top insane. The camera will zoom in perfectly to capture brutal finishers, and the games new stun attacks which act like unique grabs for each enemy once you build up their stun meter using bare-fists and the environment, Skill Tree Abilities, or other methods available. 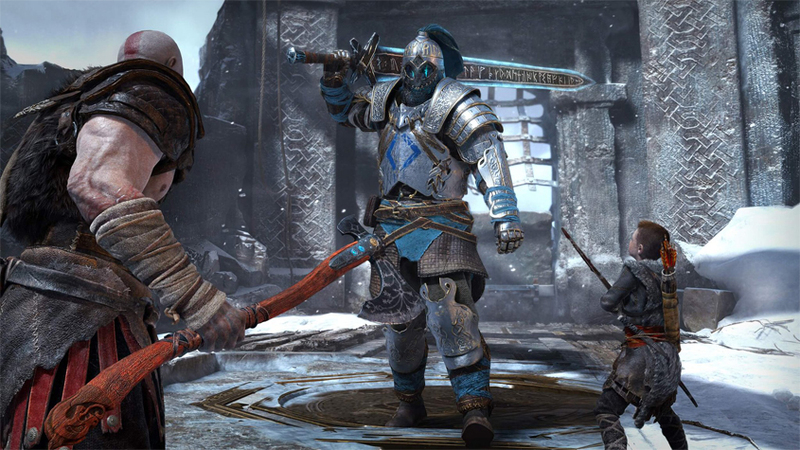 However while Souls may serve as inspiration, GoW’s RPG elements, Combos, and Skill Tree add enough unique things to the Souls recipe that GoWs combat can stand at its own, at worst the precision and timing might add some sense of familiarity, but GoWs speed, enemy design and the inclusion of Atreus make this a very different game. RPG elements feel somewhat tacked on, but also play a major role in leveling up. The game uses a power level just like Destiny surprisingly but far more refined. 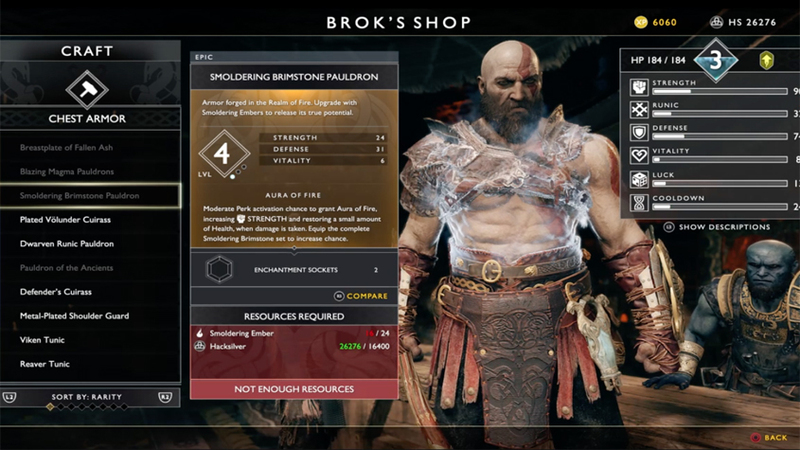 Kratos stats will stack with the armor he’s wearing which will actually be a huge source of your stats and abilities. Armor can also feature hidden perks that activate under conditions from parries to low health, some far more extensive and elaborate than others. Armor can be upgraded and sometimes have hidden perks unlocked once maxed out, in addition to gaining slots for gems, which can further add more stats, abilities, perks or affect runic attacks. Its very extensive and for those who love to experiment God of War features endless combinations, even if its armor sets are mostly reskinned. Also, God of Wars biggest gameplay problem is its bosses or lack of. The game only has a few unique bosses in it’s campaign or side quests and none of them are very memorable at all later in the game especially the final boss. The rest of the games boss design relies heavily on reskinned Trolls that are similar to the previous entries’ Cyclops. except with more of an elemental twist. They are fun to fight and act as great measuring sticks along the way but lack story relevance. Especially in certain locations of the game where you might expect to find a prominent Nordic figure or something that fits the area your in more. There are other optional hidden bosses like the Valkyries that could scratch the itch for those looking to put their skills to the test and are a great example of the games addictive and rewarding side quests. Much like the gameplay takes some ingredients from the Souls-Borne series while maintaining its own identify, the environment, level design and exploration of GoW do the same. Borrowing some of the best parts while adding enough of it’s own ingredients to make its own formula. 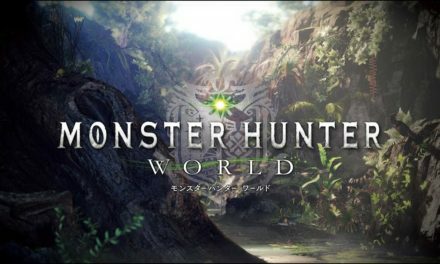 It is not open world game but features plenty of open-optional regions to explore that have just as much detail in them as anything in the campaign. While campaign missions themselves are linear, the superb level design gives way to many branching paths that often end in worthwhile rewards, alternate paths, add to the lore or may have some of the games many hidden most of the time, however it can be pointless busywork at times. Exploration in the game is encouraged and old-school exploration at that. The main hub is it own unique thing, and hard to get into without spoilers. But for those of you familiar Norse mythology it relies heavily on the Bifrost and I think this is the greatest rendition of it to date. The Lake of Nines contains most of the optional exploration and much like Nier: Automata it changes as you progress the story. Revealing new locations and puzzles, as well adding a sense of progression to the world around you. The soundtrack is my biggest gripe with the game and I expect many to tell me I’m wrong but I find the soundtrack very disappointing. While it perfectly suits and enhances the subtly intense, intimate, ominous or atmospheric moments, it really very little to offer for the action-packed moments or boss fights. I feel that many of the games action-heavy moments or bosses could have been even greater if composer Bear McCreary was able to kick in it up a notch occasionally. I’m not asking for an album full of war drums, but boss songs and action heavy cutscenes feel like they are missing a little something. But the soundtrack is well-made and expertly crafted nonetheless, time and passion has gone into it. The Sound Design makes up for any shortcomings in the soundtrack, in fact, it’s easily the best sounding God of War game ever. Whether its the Leviathan’s Axe dancing and slicing through the air, Kratos ripping open a wolves mouth, the thunderous roar of bigger enemies, or the clash of shield and weapon the sound design is another flawless, game-enhancing feature. God of War set the gaming world ablaze with its release on PS2 in the 2000s, and the Ghost of Sparta has returned to set the digital world ablaze again and claim it’s rightful place among the all-time greats of gaming once again. 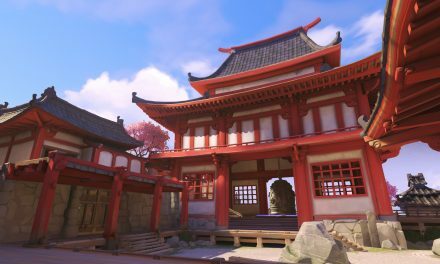 This is a small landmark in gaming and a perfect example of the endless possibilities unique to gaming alone that other mediums cannot ever hope to achieve. It is the result of imaginative, rewarding and intense gameplay being perfectly fused to incredible storytelling while offering plenty to see and do off the beaten path. 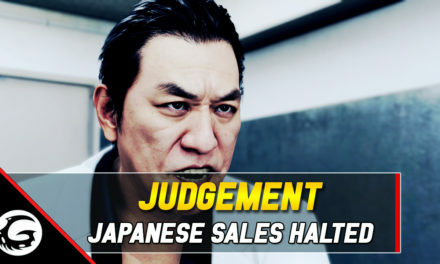 When great developers are allowed to let their imaginations unleash and are giving the funding and time to experiment, the gaming world is treated to titles like this. A game that just wants to be a game, not a paid service. God of War takes the best parts of strategic, precision-based melee combat, but does it’s best to be more rewarding and less punishing by retaining the God of War identity in terms of intensity, speed and the feeling of a power trip. It’s enemy design although lacking in quantity makes up for it quality and enemies do a great job of using all their abilities effectively, an example I hope more developers follow. It encourages players to explore with their eyes and their brain, while it does a use a compass for some objectives many valuable items and hidden locations will remain off the map, which only offers a general view of the world. I can’t think of a more appropriate character to slay any narratives or myths surrounding single-player games than the slayer of mythological figures himself Kratos. It seems almost truly meant to be in a time where some developers insist that there is no place for single-player games in 2018, despite there already being plenty of evidence before God of War, this is the embodiment of proof that single player games can still be the best experience gaming has to offer.